Ideas for designing your mini menu – pocket menu. • Have two different mini menus if you have a kids menu at your restaurant. • A kids menu should have less words more colorful pictures and a game area within them. • People eat with their eyes display more images of food in your pocket menu. • Offer coupons valid for certain days. • Be sure to mention to them to follow your business on Social Media and offer them a gift for doing so. We have mini menu templates available for you for free to use. 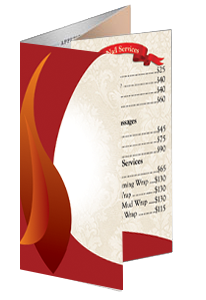 We offer mini menu – pocket menu graphic design services that will give you a high quality look and suggestions on how to make your menu more useful. We have designed many of these in house and would love to use our experience when designing your menu. Mini menus or sometimes called pocket menus are a great way to give your future returning customers more information about your menu. These will easily fit into the back of a persons pants wallet or purse.